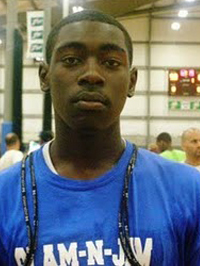 Evaluation: Energetic wing that plays above the rim Bingaya is a human highlight reel. Capable of slashing to the rim and dunking in traffic or using his speed to get out in transition he is a powerful finisher around the rim. Needs to improve his handle and jumper but he is so powerful and athletic that he can use his body to get in the lane and score or pass, where he shows excellent court vision. With some added skill work he could emerge into a true SG or possibly even play some PG down the road. Bottom Line: Great athlete that is a solid mid-major recruit. With improved handle and jumper he could easily be an all-conference performer with his athletic talents. Notes: Committed in late November to Morehead State, will miss his senior season with an injury.